Congratulations to our 2019 ACC Awards Recipients: From Left to Right – Top Row: Brandon Whatley, Julia “Julz” Decker, Jessica Vess, Misty Rasmussen, Georgia Xydes, Felix Villarreal, Brenda Chinnery. Middle Row: Todd Phillips, Bernadeta Kaminska, Richard Rhodes, Jeff Stringer, Steven Turner, Curtiss Stevens. Bottom Row: Missi Patterson, Luz Arroyo, Rosa Carrasco, Amardeep Kahlon. Not Pictured: Anne Fletcher, Anne-Marie Thomas. 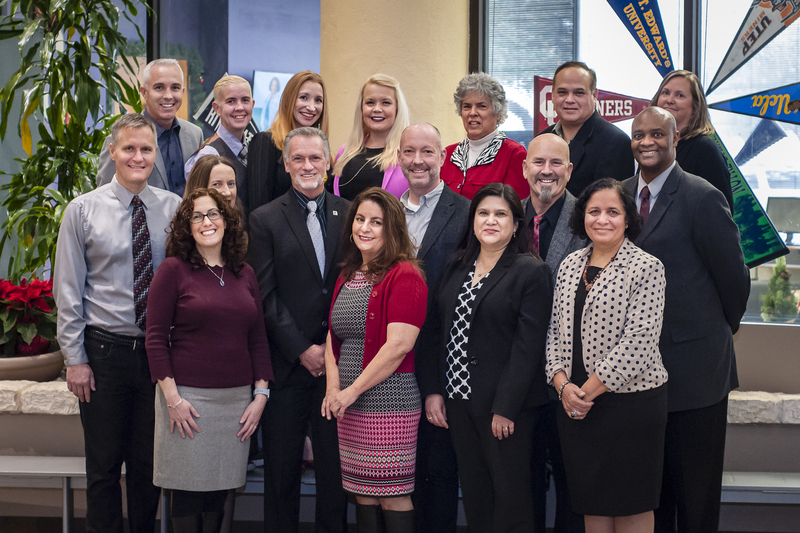 Each year the President/CEO and the ACC Board of Trustees honor outstanding Austin Community College faculty and staff who have been selected for Leadership and Teaching Excellence Awards. The 2019 ACC Awards Dinner will be hosted on Thursday, April 18, 2019 at the Hyatt from 6:30 p.m. – 9:00 p.m. in the Foothills Ballroom, located at the top of the Hyatt Regency Hotel in downtown Austin, Texas. This awards dinner is a wonderful celebration of the hard work and leadership of these dedicated ACC faculty and staff members. The National Institute for Staff and Organizational Development (NISOD) has emphasized the importance of teaching and leadership excellence in institutions of higher education. Recipients of the NISOD Excellence Award are recognized at the annual International Conference on Teaching and Leadership Excellence, and this award honors the world’s best in higher education. Please join us in congratulating the following ACC faculty and staff members receiving the NISOD Excellence Award. The ACC Teaching Excellence Awards honor one full-time and one adjunct faculty member who promote special learning opportunities, student interaction, depth/breadth of knowledge in a subject area and innovation. Nominations are made by students, faculty and staff and the honorees. Recipients are selected by committee and presented with an award and a $1000 cash prize. This award recognizes an outstanding ACC Faculty member who has creatively utilized appropriate Internet-based technologies to teach online and/or hybrid courses at ACC. The recipient must have designed and taught one or more online or hybrid courses with an imaginative approach, well-designed course materials, instructional strategies, and a demonstrated rapport with the course participants.